Scotland: Towards a second indyref? While not committing to a indyref immediately or even definitely proposing to have one, the SNP are using the threat of a second referendum to try and extract from the UK government and the EU an agreement that Scotland can negotiate access to the European single market and for Scotland to continue having a relationship with the EU. According to all opinion polls, the Scottish National Party looks certain to win another overall majority at Holyrood. No doubt the SNP leadership will claim the result as a confirmation of their policies. But that would not paint even half a picture of the real situation. £1 billion in council cuts over the next two years is the consequence of the funding deal from the Scottish National Party (SNP) government, which will mean the loss of 15,000 jobs and the decimation of services if implemented. 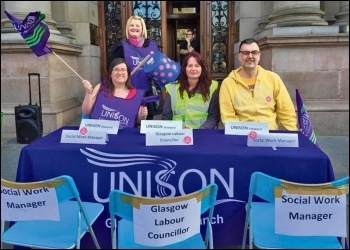 Trade unionists and anti-cuts activists in Scotland and North-West England held conferences to plan work with the Trade Unionist and Socialist Coalition (TUSC). 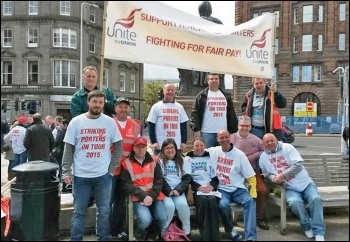 The Dundee hospital porters are into their sixth week of all-out strike action as we go to press and they are as strong and determined as ever, writes Philip Stott.